Every year a group of U.S. Army Special Forces Soldiers conduct a Green Beret wreath laying ceremony at Arlington National Cemetery in Virginia to honor the late President John F. Kennedy. Senior level defense officials and a representative of the Kennedy family also take part in the ceremony. President Kennedy was a keen observer of modern day conflict (1950s – 1960s). He had a strong appreciation of how insurgencies had grown – whether anti-colonial (nationalistic) or communist (supported by the Soviet Union) in nature – to confront the interests and goals of the United States around the world. Much of the non-traditional conflict that the United States was faceing in this time period was a result of the competition between the United States and the Soviet Union -known as the “Cold War”. To deal with these “national wars of liberation” that threatened U.S. interests and it’s allies President Kennedy set out to ensure that our military forces embraced the concept of Unconventional Warfare. He ensured that elite units like the U.S. Army’s Special Forces and U.S. Navy SEALs received the support from their parent service in terms of resources, money, and equipment. As President Kennedy was a huge supporter of the Special Forces community. 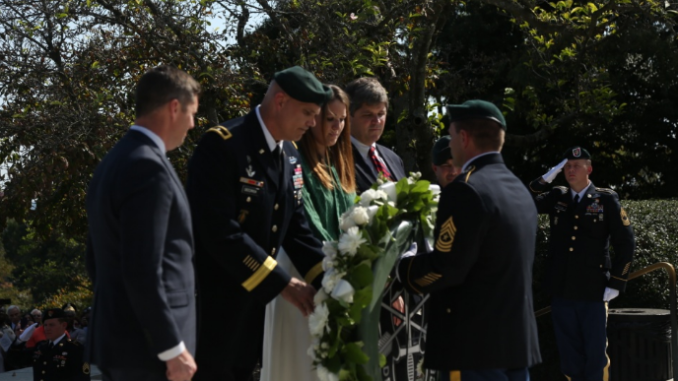 Part of the legacy of the Green Berets can be attributed to JFK – which is why after all these years the SF community continues to honor this late president in the Green Beret wreath laying ceremony. Read more in “John F. Kennedy Wreath Laying Ceremony 2016”, DVIDS, October 19, 2016.